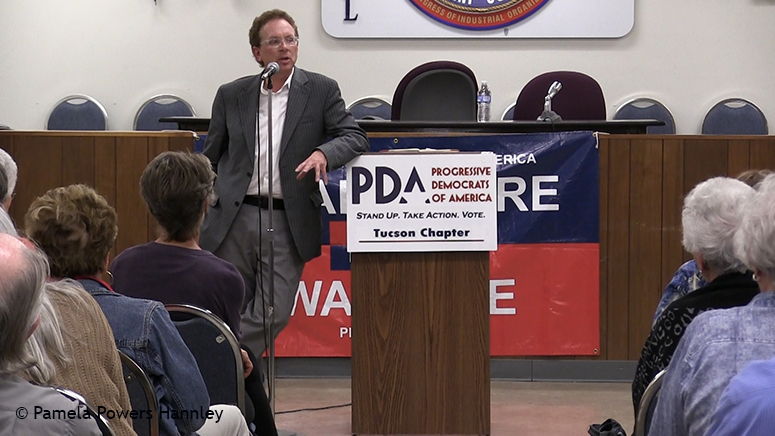 John Nichols of ‘The Nation’ addressed progressives and unionists at a recent Tucson event. The United States is the world’s largest democracy, we spend an obscene amount of money on elections–more than any other country–and we have the lowest voter turnout. The trend has been: the more money that is spent, the lower the turnout. Since the 2014 election– which had the lowest voter turnout since 1942– many people have been asking: Why aren’t Americans voting? When you consider the horrible financial mess the Tea Party is making of red states like Arizona, there also been a lot of non-voter bashing and shaming. But does that do any good? I think not. At a recent John Nichols event, hosted by PDA Tucson and the Pima Area Labor Federation, Nichols shed light onto the inverse relationship between money spent and votes cast. Nichols told the crowd of approximately 130 progressives and unionists that Americans don’t vote because negative television commercials repeatedly tell us not to. Check out this excerpt from his talk below. I was unable to hear him in person. Was delighted to find a clip here. Alas I only got a third of it. Please caption or include text below for those of us (millions) who are hard of hearing. Money,money, money that is all the white democrat elitists think about and how it will derail their ego trip run for office. How much money would it take to defeat our two hispanic congressmen. How many television ads would you have to buy to get hispanics who hate racist republicans to vote republican even if they changed their name to cesar chavez or malcolm X! Stop running fred duvals and dark money won’t be effective.